The Youth Choir is open to individuals from ages 13-18 years of age. The Youth Choir rehearses two Thursdays per month, from 6:15-7:15pm. 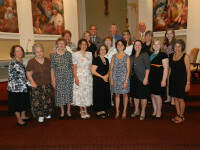 This choir provides music once a month for the Saturday evening 5:00pm Mass. The Adult Choir is open to individuals from ages 18 years through adult. No experience is necessary. The Adult Choir rehearses on Thursday evenings from 7:30-8:30pm. This choir provides music for the 11:00am Sunday Mass.